One of the most fascinating artifacts in the Star Wars universe is the dark lightsaber (also known as the “darksaber”), which had initially appeared in several episodes of Star Wars: The Clone Wars. 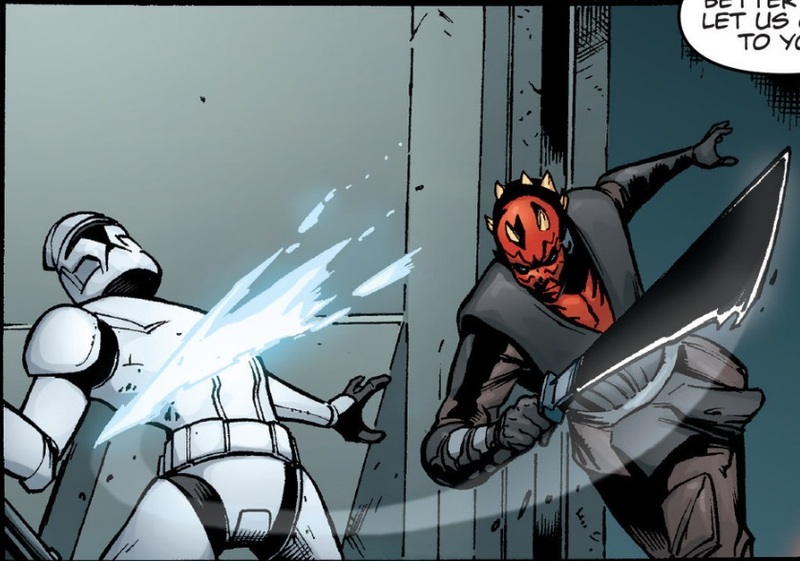 In Star Wars: The Clone Wars, we see the darksaber possessed by two characters: Pre Vizsla and Darth Maul, the latter of whom won it from the former. However, when Darth Maul is captured (yes, that will be the subject of a future post), he loses control of it and we see it lay on Mandalore. What happens to it next? 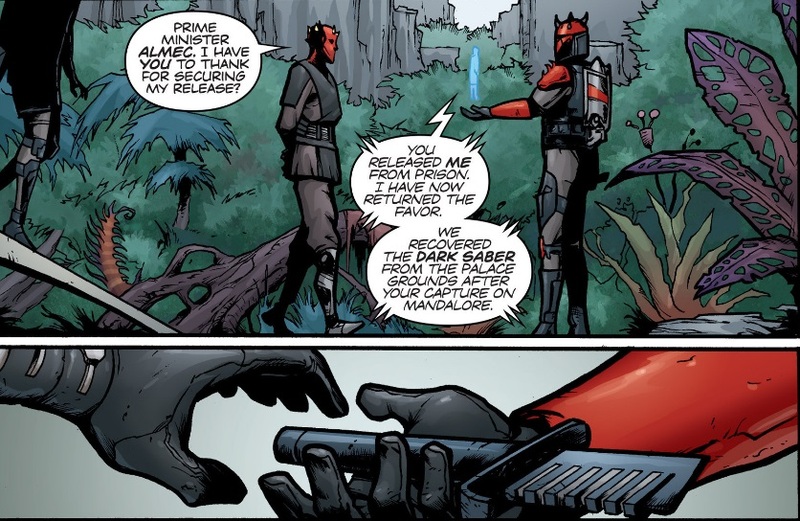 Early on in the comic, Mandalorian commandos boost Darth Maul out of Darth Sidious’ prison, followed by Maul joining up with the Mandalorian commandos on their base on Zanbar. While there, he communicates with Prime Minister Almec, who tells him, “We recovered the dark saber from the palace grounds after your capture on Mandalore.” Thereupon, a Mandalorian commando furnishes Maul with the darksaber. The first battle in which Darth Maul wields the darksaber is when Separatist forces attack the base of the Mandalorian commandos, where Maul uses it against droidekas, supper battle droids, and, finally, General Grievous. Later on, following another battle, we see Maul holding the darksaber up against count Dooku’s neck, although Maul does not use it in battle against him. In a later battle against clone troopers and Jedi, we see Maul breezily slice down a clone trooper, then use the darksaber to take on both Aayla Secura and Mace Windu (and possibly also Obi-Wan Kenobi, although it’s unclear). 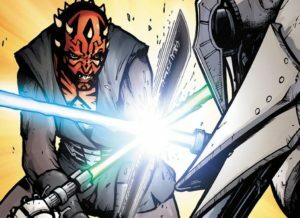 In the comic book’s final battle, we see him once again using it to fight against General Grievous, although he is able to Force-push him away to end their skirmish. 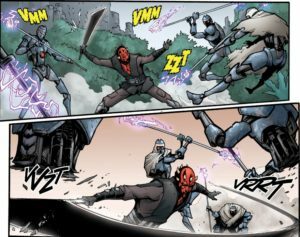 It is unclear if Maul is either able to maintain possession of the darksaber or, if after the events in “Darth Maul: Son of Dathomir”, he loses it and regains possession of it until we see it next in Star Wars Rebels. 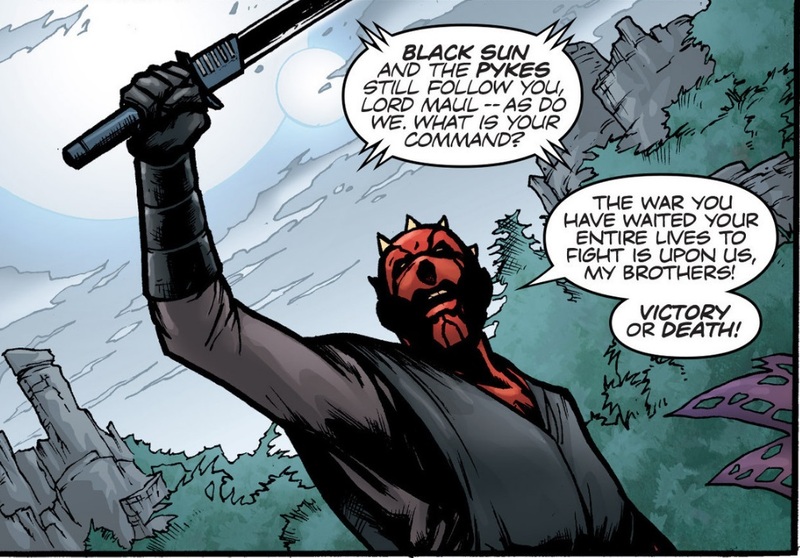 Perhaps that is a story for another time, but at least we know how Maul regained possession of the darksaber in the Clone Wars.